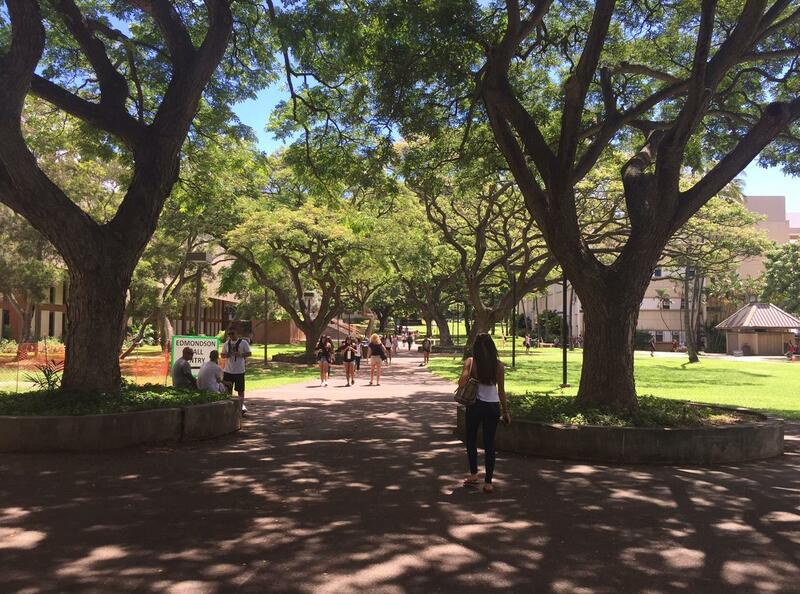 Tree-lined McCarthy Mall runs between the Campus Center and Hamilton Library on the UH Manoa campus. One new trend on university campuses is doing away with textbooks! With the average text now at $125, books can add a cool $1500 to a semester's tuition, and efforts are underway to find suitable academic substitutes. 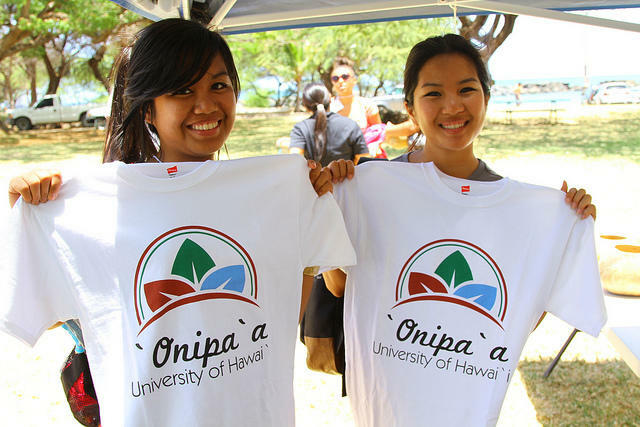 Here in Hawai‘i, over 85 thousand students across the state are launching the academic year in the University of Hawai‘i system, thirty one thousand of them in the community colleges. The four year graduation rate at UH is near 25% now, nothing like the UC system’s 60-70%, but greatly improved thanks to new efforts to nurture students and clarify their degree requirements. HPR’s Noe Tanigawa reports. 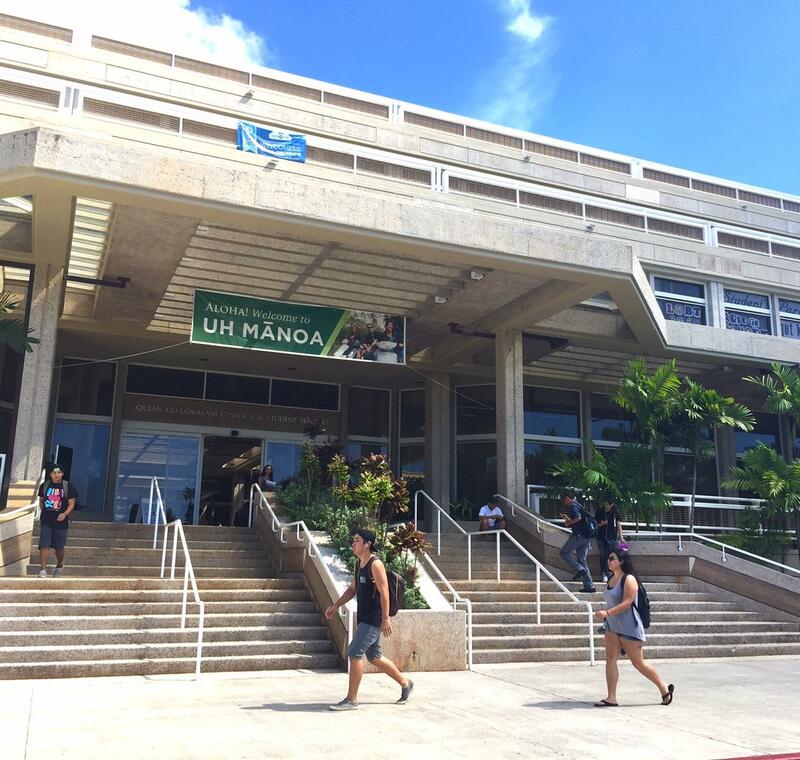 A look at how student empowerment at UH Manoa is helping them graduate--and make the most of their experience, plus a quick survey of community college trends. Here’s a handy compilation of current enrollment data in the UH system. Susan A. Lee, Director of Marketing and Communications in the Office of the Vice President of Community Colleges sent an informative run down of trends and opportunities at the Community Colleges. - Technology and STEM majors are rising in popularity amongst both male and female students. Computer-based technology programs continue to grow in popularity due to demand in the workplace and changes in industry needs. And science programs are in hot demand. - Programs that provide opportunities for entrepreneurial pursuits are also growing in popularity, such as the Agropharmacognosy and Agripharmatech programs at Windward Community College, which prepares students for entrepreneurship in agribusiness or plant-based product manufacturing, etc. - Pathway programs that lead to bachelor's degrees at the four-year universities are also trending high with Teacher Education, Engineering, Liberal Arts, Business and the Sciences. There has been major increases of students declaring majors in STEM fields at all campuses. The Architectural Engineering and Computer-Aided Design (CAD) Technologies program just made curriculum changes to emphasize land surveying, GIS/GPS, and CAD skills, and these classes are growing in popularity. · Agriculture and Diesel Mechanics are growing in popularity with consistently full classes. · Automotive Mechanics Technology and Electrical Installation and Maintenance Technology programs have been popular and sustained full classes for many years. · As always, our Carpentry program, with it's Model Home Project, continues to be popular. · As of August 28, Honolulu is still up 4.5% from last year's numbers. · Our Computer, Electronics, Networking Technology (CENT) program has grown by 37.5% since the 2012-13 year, due to: increased workplace demand, faculty connections with employers, curriculum changes that align instruction with industry certifications and need; program alignment with four-year programs, esp. UH West O'ahu. · We are currently in the second year of an Early College High School (ECHS) partnership with Farrington High School, which is an initiative designed to allow high school students to earn six or more college credits before they graduate from high school. Courses currently offered include ENG 100, SOC 100, MATH 103, PSY 100, and SP 151. These courses are taught at the high school. This program is funded by Hawai'i P-20 Partnerships for Education with the support of the Harold K.L. Castle Foundation and GEAR UP Hawai'i. · In addition, Honolulu Community College has formed ECHS partnerships with McKinley, Roosevelt, Pearl City, and Kalani High Schools and we have a combined total of approximately 150 students, grades 10-12 enrolled in courses for Fall 2015. All of these efforts combined help to support the Hawai'i Graduation Initiative, which aims to increase the participation and completion of students in our system. · For the first time, Kapi'olani CC is offering a Hawaiian language course at Kamehameha School at the Kapalama Campus for college credit. · Fastest growing is our STEM (Science, Technology, Engineering and Math) Programs. The Associate in Science (AS) degree in Natural Sciences has experienced a 76% increase since 2013, with a total of 407 declared majors for Fall 2015. Our science courses are always the first to fill. · Topping the Career & Technical Ed list is our Health Information Technology program, which boasts a 67% increase over 2 years with 195 declared majors. · By far the biggest growth is in our Early Admit (Early College) program, going from 164 in Fall 2013 to 360 this fall, more than doubling enrollment. · Another rising trend is the number of classes being offered with ZERO textbook costs. Last year, we had 5 instructors committed to Open Educational Resources or alternatives to textbooks. This year more than 54 classes are being offered without textbook costs to the students. Currently the average textbook cost in the state is $125 or approx $1500/year per student. Leeward currently offers the highest number of courses offering this option. We estimate we have helped students saved $150,000 to date. · Windward Community College is seeing amazing growth in our Vet Tech program, both for Vet Assisting certificate and Vet Tech AS degree programs. So much so, that we are now working together with Maui College to offer a hybrid online/in-class labs program at UH Maui College. · We also see popularity with our Hawaiian Studies AA degree and our plant-based Agripharmatech certificates (plant biotechnology and ethnopharmacognosy), both inspiring entrepreneurial pursuits. · Our business courses are leading students to Shidler, as we are focusing students to fulfill pre-requisites for entry into the Shidler College of Business. · Pre-engineering is another popular area of study, as witnessed by the world by the recent launch of a payload into space in August. · Pre-nursing is also popular. We have many students going from CNA (with emphasis on both Hawaiian and Western traditions to care) to pre-requisites for nursing to gain entry into Chaminade, HPU and UH nursing programs. · Our journalism program is excellent, with our newly hired instructor, Kimberlee Bassford, who has Harvard and Berkeley credentials and is an acclaimed documentary filmmaker. · Growing programs in the arts are drama and theatre, photography, drawing and painting and ceramics. All very popular and exciting arts programs. By now, most seniors in high school have found out where they’ll be going to college in the fall. But the question of how to pay for it remains a challenge for many families. And that conversation usually begins with a single form. HPR’s Molly Solomon explains.